Seribu Islands Regent, Budi Utomo asked Transportation Sub-dept. to budget floating bridge repairment in Lancang Besar Island, Pari Island.
" Its condition is really dangerous. 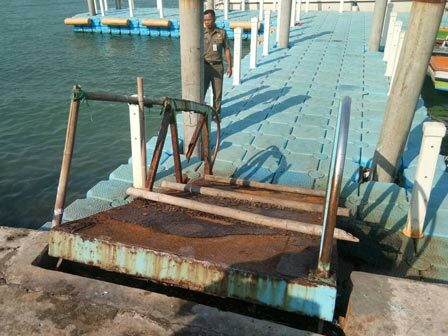 This must be budgeted quickly since it is the main pier of Lancang Island"
"Its condition is really dangerous. This must be budgeted quickly since it is the main pier of Lancang Island," he said, Tuesday (6/20). Meanwhile, Pari Island Urban Village Head, Surahman added that floating bridge is the main bridge and the only access which was built since 2011. "It is in damaged condition for almost one year and we often repair it. Maybe it is the time to change with the new one," he expressed. He added that main pier is also used as visitor's access for fishing tour that always crowded every weekend.